S T Cervia has a problem ! Re: S T Cervia has a problem ! The poor old girl has not been out of the water for over 35 years, her wind and water line must be like an egg shell in places. 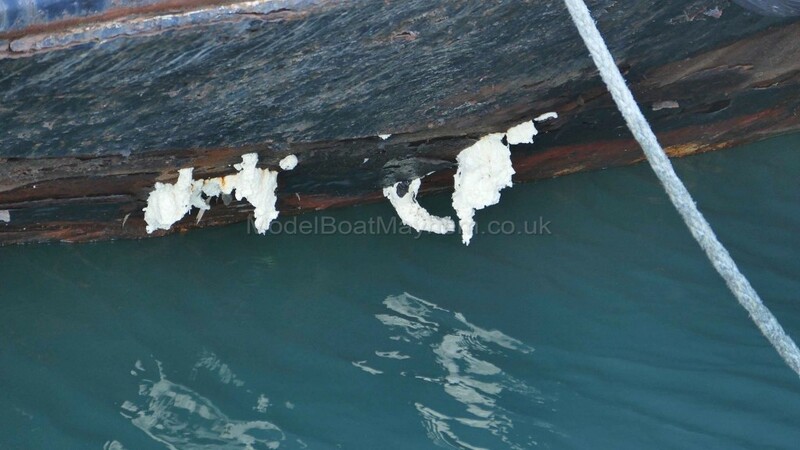 A couple of pictures of the Cervia,s wind and water line aft, with builders expanding foam poking out of some holes. Incontinence has set in. Looks like she needs a new bottom . Just as we had finished putting up the lights for the annual Ramsgate harbour Christmas light show, the cervia sprang a leak in the engine room under the deck plates. 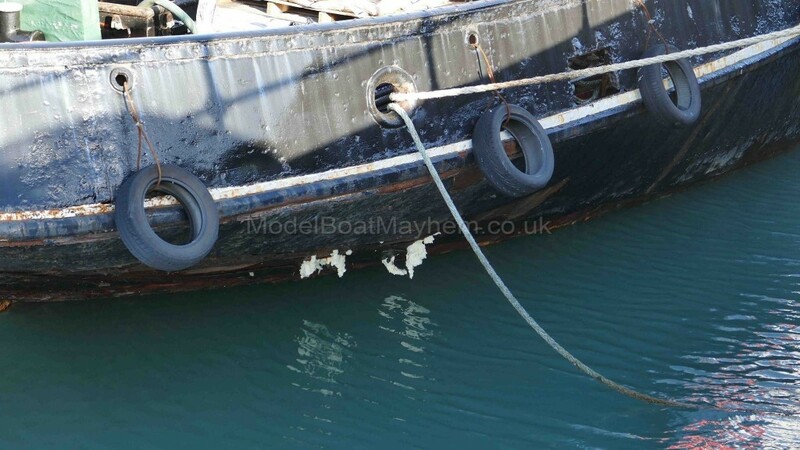 At first it was only a small one and the bilge pumps were coping, however two hours later, the small hole became the size of a football and the water completely flooded the engine room to a depth of ten feet. The RNLI came to the rescue with three large pumps and for a while maintained the level. the next morning the fire brigade sent two fire engines and did some serious pumping out. next, two divers fixed a patch over the hole . it is still leaking but our own bilge pumps are managing to keep the water level down to below the plates. A decision as to the long term plan has yet to be taken. So, merry Christmas to all our supporters and please visit the amazing light show in Ramsgate harbour. Castle. She had pepper pot holes betwixt wind and water and after survey was scrapped. A sad end to a fine Lady. Underwater plating, which is thin to start with, just wastes away over time, particularly in salt water so the plates become thin and perforated. Even worse if the metal is alternately submerged and exposed to the air. Assuming that the underlying frames are not rusted througn the only solution is complete replacement which is very expensive. In the case of the Medway Queen they had to build an entire new hull (to go with the replacement superstructure!). Cervia will never command the sort of funding needed to do that. a case of too many ships to "upkeep" and too little money to go around. Yes, once you stop maintaining a vessel it deteriorates with frightening speed and rapidly to a point where there is little or no hope of remedying the situation without a massive injection of funds. And then you need a subsequent regular income stream to keep it in reasonable condition. The most successful preservation project is where a well maintained vessel has gone directly into a conservation scheme backed by a sound business plan and even then raising sufficient ongoing funding is a constant struggle, Waverley is an example. knock out the "T" in that web page address, and that is exactly what you have got, sadly. Corrosion usually occurs significantly more aggressively at the water line where repeated application of salt water followed by a ready supply of oxygen creates the best conditions for oxidation. Deep under the surface there is comparatively little oxygen present so corrosion is limited and high above the water line the fresh supply of salt water is not quite as plentiful. As has been mentioned once the prescribed acceptable limit of plate thickness has been reached, as per the Classification Societies rules for the vessel type and operation in question, then the only acceptable permanent repair is plate replacement. Any other repair will attract a 'Condition of Class' with a time limit for correction. Thanks for the explanations folks. Sadly a bit of Cure Rust doesnt look to be a solution for that paddle steamer. Nature is reclaiming her by reversion to base elements, dust to dust , rust to rust , rot to rot . When archeologists dig that creek in years to come they wont have anything to work on except a few brass screws and the cocktail shaker from the bar. On a more serious note, these situations demonstrate very clearly the value of scale models as being the only surviving 3D representation of famous ships and boats. No painting, photo or drawing can show the vessel as she was in such detail and from all angles. The latest 3D scan techniques offer an opportunity for digital records to be kept but only for vessels still in existence although I believee the Science Museum did carry out 3D scanning of their ship models before the gallery was closed. Better than nothing but is a pity that lack of public interest effectively closed down such a rich resource of maritime information. Ryde has now been given up as a lost cause - inevitable really. Old steel/iron hulls do not last for that matter nor do wood built vessels. Those in preservation invariable end up being completely rebuilt with new such as the Waverly and even to a large extent the Victory/Cuttysark. As mentioned plans and models are probably the best way to preserve the memory of these vessels, the money to preserve the original is astronomical and then which ones do you keep.